Paperback, 8.5 x 10.5 in. / 240 pgs / 200 color. Foreword by Ralph Rugoff. Text by Julia Bryan-Wilson, Adrian Heathfield, Stephanie Rosenthal. 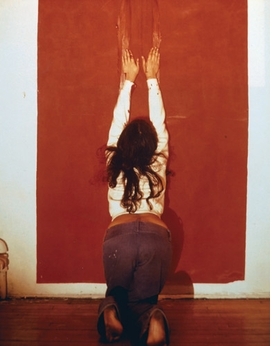 During her short career, Ana Mendieta (1948–85) created a body of work that was provocative and radically inventive. Using her own body, together with elemental materials--blood, fire, earth and water--she created visceral tableaux and ephemeral "earth-body" sculptures exploring life, death, rebirth and spiritual transformation. Much of her art also expresses the pain and rupture of cultural displacement and exile (Mendieta was born in Cuba, but sent to the US as a child). In her work, the outline of her body is consumed by gunpowder, fireworks, or advancing waves; and ancient goddess-forms are shaped from sand, carved into rock or incised into clay or onto leaves. The media are exceptionally diverse, but the images are consistently compelling, mysterious and poetic. Encompassing a wealth of drawings, photography and film, Ana Mendieta: Traces provides a comprehensive and illuminating overview of this highly influential artist’s work. Essays by art historians Julia Bryan-Wilson and Adrian Heathfield, as well as Stephanie Rosenthal, Chief Curator at Hayward Gallery, provide an array of new approaches to Mendieta’s practice. This publication also includes a wide-ranging and richly illustrated anthology of never-before-seen material, including Mendieta’s own notebooks, exhibition plans and correspondence, the result of unparalleled access to the Ana Mendieta Archive. Filled with new imagery, ephemera and scholarship, Ana Mendieta: Traces provides a comprehensive introduction to this major twentieth-century artist, as essential for Mendieta experts as for those coming to her work for the first time. "Body Tracks" (1974) is reproduced from Ana Mendieta: Traces. 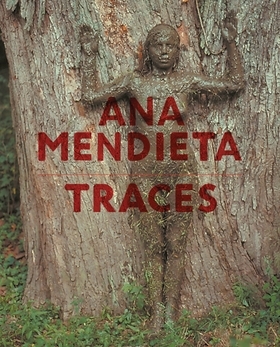 Traces is an exceptional exhibition catalogue that offers new scholarship on Ana Mendieta (1948-85), an artist who pursued a range of media in the production of her "earth-body-art," which addressed the placement of a female form in a landscape. The three essays move beyond the ingrained horror of her death, and focus instead on the context of Mendieta's work. This focus includes her sense of displacement and identification as a double minority in the North American art world of the 1970s-80s; and the themes of her works, e.g., transience, absence, violence, and belonging. Curator Rosenthal addresses Mendieta's evocation of the liminal spaces between art and documentation; the inseparability of her body, her life, and her cultural heritage; and her blurring of artistic boundaries among body art, land art, and performance. Heathfield examines Mendieta's atemporality and the migration of her work across disciplines. Bryan-Wilson critiques the artist's classification as a feminist. Full-color images are featured throughout. A visual and textual anthology of archival and source material is supplemented by a brief bibliography, notes fro each essay, and a exhibition checklist--all of which point readers to further information. Exceptionally rich, this catalogue is a necessary purchase do all academic libraries. FORMAT: Pbk, 8.5 x 10.5 in. / 240 pgs / 200 color.